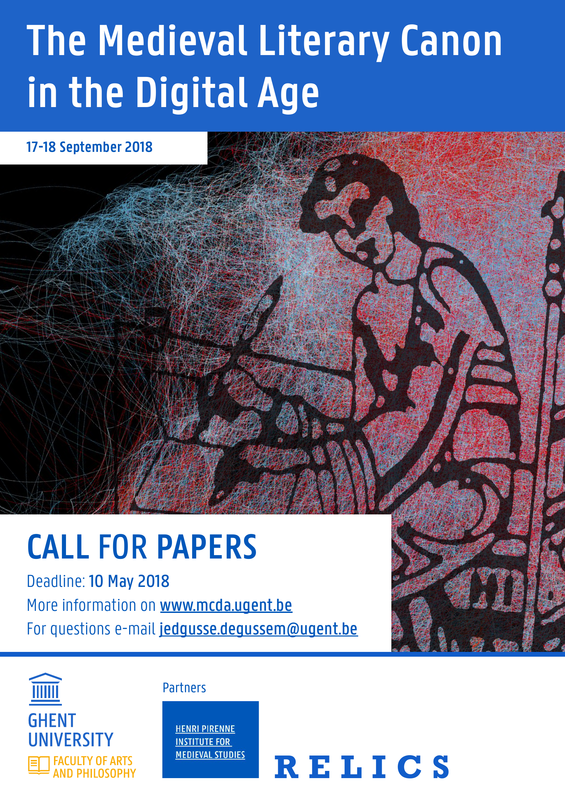 We invite submission of abstracts for the international conference “The Medieval Literary Canon in the Digital Age,” to be held at Ghent University from 17-18 September 2018. The conference, to which we will accept 8 scholars in addition to the confirmed speakers (see infra) will consist exclusively of plenary sessions, with ample time for discussion. The conference committee encourages proposal submissions by both established and junior researchers. Please send abstracts (ca. 300 words) and a five line biography via email to Jeroen De Gussem by the ​10th of May. Participants will receive a notification concerning the acceptance of their application by the end of May. We expect from our applicants that they have the ability of covering their own travel costs. Accepted speakers are offered lunches and an invitation to our conference dinner. Accepted speakers from abroad (any country other than Belgium) will also be offered up to 3 hotel nights in Ghent.